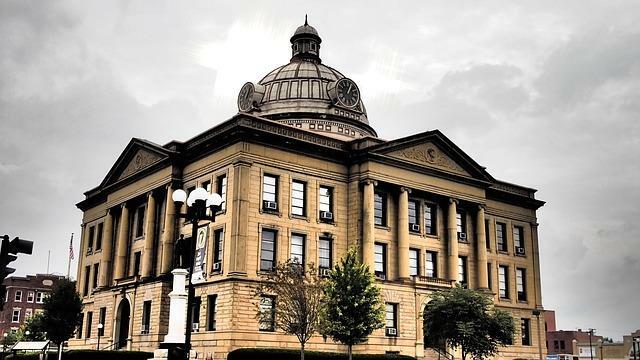 The follow guest post was submitted to PowerHouse SMART® by Nick DiCosola, DiCosola Group via Illinois State Representative Deanne Mazzochi. This information is provided to PHS Members as a professional courtesy. PHS is not representing their politcal opinion. If you are a contractor, property developer, realtor, bank, title company, etc., you need to know about the bill HB2838. Please pass along to anyone you know on this side of the industry. HB 2838 amends the Illinois Wage Payment and Collection Act. Provides that, for contracts entered into on or after July 1, 2019, a direct contractor making or taking a contract in the State for the erection, construction, alteration, or repair of a building, structure, or other private work shall assume, and is liable for, any debt owed to a wage claimant or third party on the wage claimant's behalf, incurred by a subcontractor at any tier acting under, by, or for the direct contractor for the wage claimant's performance of labor included in the subject of the contract between the direct contractor and the owner. Provides for enforcement by the Department of Labor. Provides authorization for third parties owed fringe or other benefits or a joint labor-management cooperation committee to bring a civil action to enforce liability against a direct contractor. Provides exemptions for work done by an employee of the State or any political subdivision of the State. Provides requirements and guidelines for notice, awards, filing, and records retention. Provides that the new provisions are severable, and that the obligations and remedies provided are in addition to any obligations and remedies otherwise provided by law. Provides that nothing the Section shall alter specified obligations and penalties set forth in the State Prompt Payment Act. Effective immediately. What Does Illinois HB 2838 Bill Mean? ANYONE who has earned wages on a project (whether a sub, sub of a sub, etc.) now has a right separate and apart from the mechanics lien statute to demand a direct contractor (e.g., general contractor) pay any wages or benefits that the subcontractor didn't pay to his or her own employees. Assume people who work for a drywall contractor are not paid (even if the reason for non-payment is that they did bad work, etc.). The general/property owner paid the drywall subcontractor the full amount owed under their contract. The general/property owner received the mechanics lien waiver. That no longer protects the general or the property owner. The general contractor STILL has to pay for all of the unpaid "wage, fringe or other benefit payment or contribution, including interest owed" according to the wage earner. Essentially, every project is now at risk for double-paying, and then some, on subcontracted jobs. Further, not only can wage earners independently file suit outside the mechanics lien process, the Illinois Department of Labor is separately empowered to go after every contractor for what they view as unpaid wages owed. (In a Democrat-controlled government, labor will win every time). The unions are likewise empowered to go after the contractor, even if the general contractor is non-union. Making matters worse, any "property of the direct contractor may be attached after trial for the payment of any judgment received," and "direct contractor" is defined as ANYONE who has made or taken a contract in Illinois for erection, construction, alteration, or repair of a building or structure, at any tier of work. That is broad enough to cover property management companies, realtors, banks looking to do repairs on foreclosures, etc. This requires an immediate strategy to stop the bill on the Illinois Senate side. If it hits the governor's desk, it will get signed; no-one is telling the unions "no." 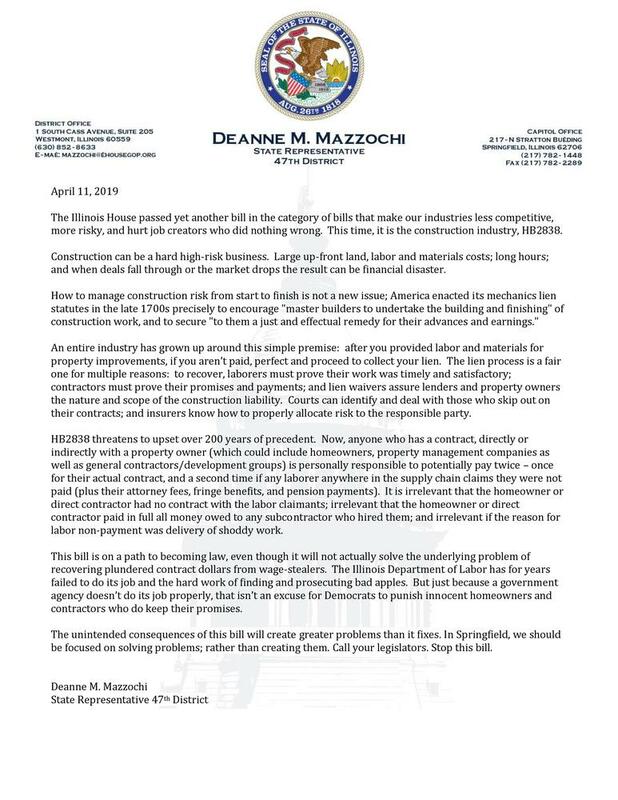 If this is of interest to you, please reach out to State Representative Deanne Mazzochi's office at (630) 852-8633; or better via email to mazzochi@ilhousegop.org; and dmazzochi@rmmslegal.com, and put "STOP HB 2838" in the subject line.